Published Dec 28, 2017 By Julia 6 CommentsThis post may contain affiliate links. 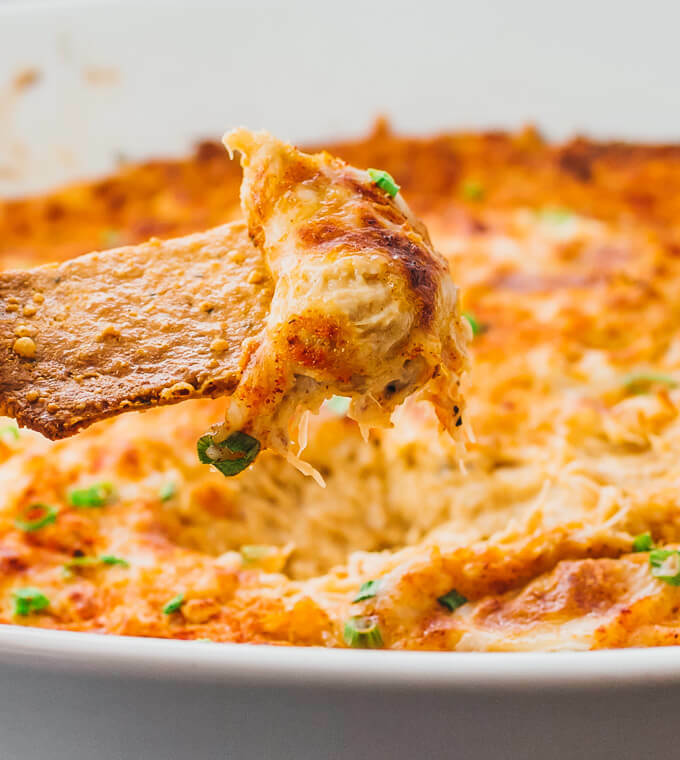 An exquisite hot crab dip made with cream cheese. No mayonnaise needed. 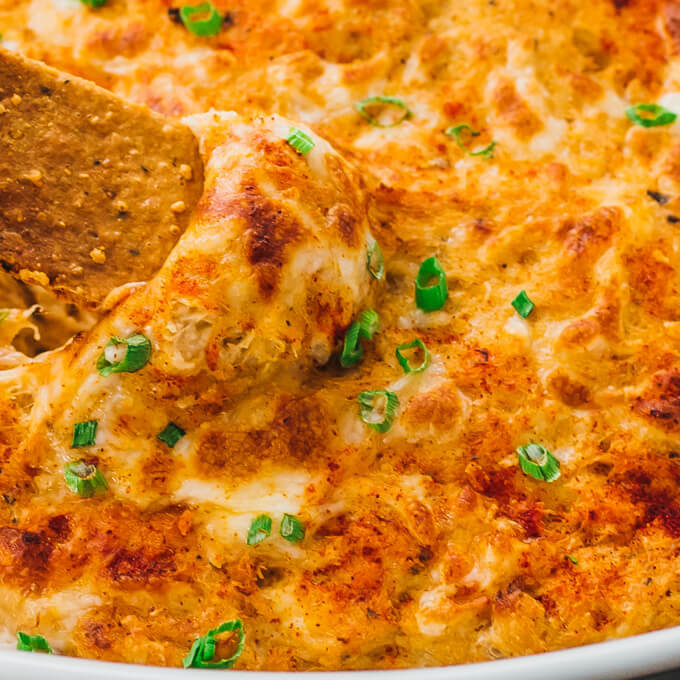 This crab dip is one of Mr. Savory Tooth’s favorite recipes. It’s up there on the list with my slow cooker chicken tikka masala and zucchini lasagna. Made using cream cheese and mozzarella, it’s a fantastic dip that’s served hot and packs a bit of spicy heat. It has a great creamy texture and a golden brown crust. It’s the kind of dip that’s a total crowd pleaser, even for those who claim that they don’t really like crab. You can serve it at your next party, such as for New Year’s Eve or Super Bowl. It’s both easy to make and looks fancy enough to bring to a nice reception. 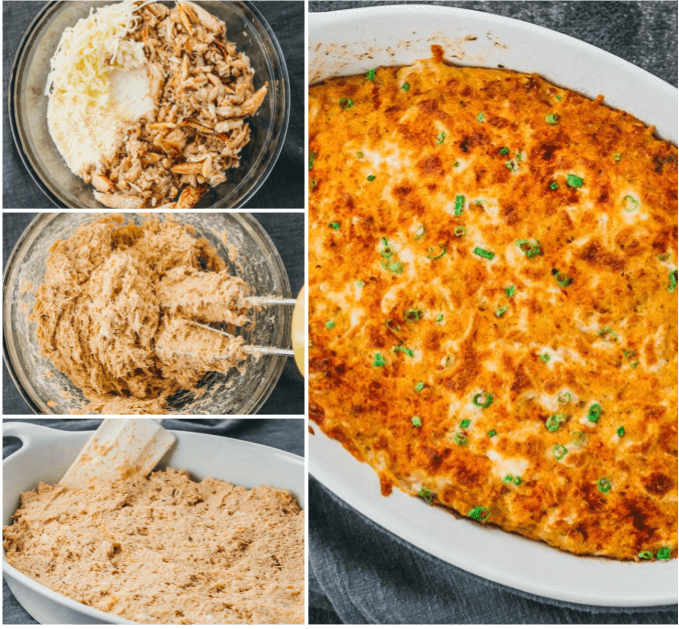 I’ve made this crab dip numerous times to perfect it. From my experiments, I found that a high ratio of crab meat to other ingredients is ideal, and you’ll find that other recipes tend to use less crab meat. I much prefer a hearty dip that is thickly packed with crab. I typically use fresh crab, but you can use canned versions as well. Just make sure that the crab meat is well drained (squeezed dry) before using. The weight listed in the recipe below refers to the drained weight. It’s essential to make sure that the crab mixture is well beaten and smooth before baking, or you won’t end up with a cohesive dip. To do so, you’ll need to use cream cheese that has been softened to room temperature (you can give it a quick zap in the microwave to speed along the process) and an electric mixer to beat everything together. I’ve tried making this dip without a well-blended mixture, and the results are nowhere near as good. I didn’t include mayonnaise in this recipe because it will thin out the dip. You can certainly include some if you prefer the taste of mayo — I would recommend no more than 1/2 cup. 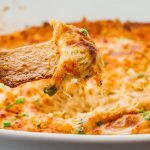 I like to serve this crab dip with homemade low carb crackers, as pictured here. Other great dippers include carrots, pork rinds, mini bell peppers, and celery. If you’re not on a low carb diet like me, you can serve this in a bread bowl. This recipe can be made ahead of time. Simply follow the recipe to assemble the mixture in the baking dish and refrigerate. About an hour prior to serving, remove from the refrigerator and let it stand at room temperature for 20 minutes to soften, then proceed with the baking step. 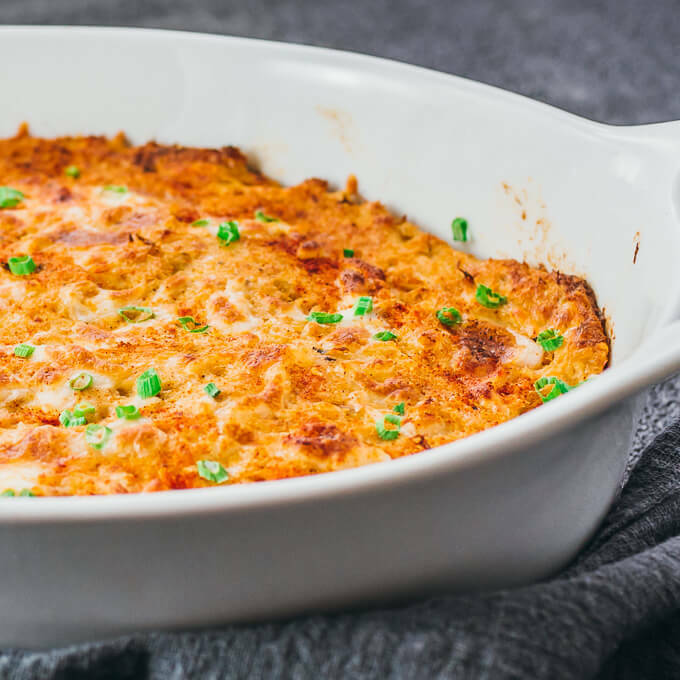 An easy recipe for creamy hot crab dip with cream cheese. Combine all ingredients except toppings in a large bowl. Beat with an electric hand mixer until well-mixed, occasionally pausing to scrape down the mixer’s beaters and bowl. The resulting mixture should be smooth and thick, without any clumps of cream cheese or crab. Transfer the mixture to a baking dish, spreading it out evenly. Bake at 350 F until heated through and puffy, about 30 minutes. Remove from the oven and evenly top with cheese, paprika, and sliced scallions. Broil until the top is golden brown, a few minutes. Watch carefully to avoid burning the cheese. This recipe yields 3 g net carbs per serving. Do you prefer smoked paprika? Or just regular? Smoked paprika is my preference, but any kind of paprika will work here. Hi Julie! That’s right, no garlic. I didn’t find that it was needed. But it never hurts to add a few minced cloves! Wow that looks so good! It’s beautiful baked! YUM! That looks delicious! Thanks for the recipe.I pinned it.